KILLINGTON — How does one know it’s the season for competitive swimming? By hearing the early morning swimmers jumping into the pool at 8 a.m., chlorinated hair, Tuesday night meets, speedos (yes, speedos!) and laughter all around! 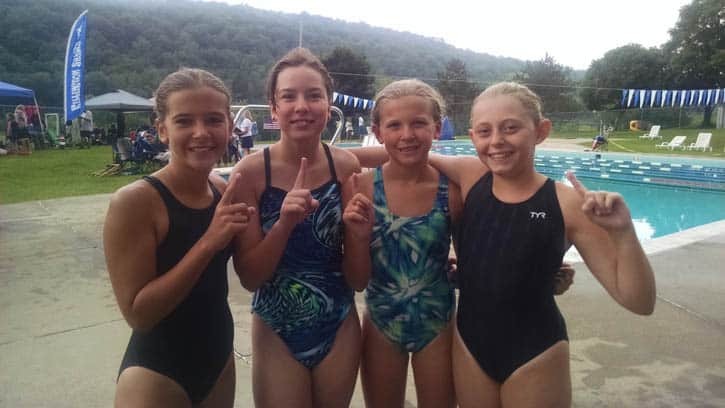 The Killington Sharks team has almost doubled their numbers this year, with 36 swimmers total. The team began practicing in June and is wrapping up their season with two home meets, districts, and state on Aug. 1 and 2. The team has traveled to Manchester, Woodstock, Bennington, and Rutland. The boys team has not lost a meet this year, and the girls team normally finishing second out of three teams. This is impressive considering Killington is considered a smaller team. Most summer teams have over 50 swimmers. Swimming is one of the few sports where an entire family can be on the same team, male or female. The sport also relies on parent involvement and community support.